We cordally invite you to the press conference for the international Lions Golf World Cup & European Championship 2016. Date: September 14, 2016, 11:00 a.m.
After a very successful Lions Golf World Championship 2015 with 200 visitors from 35 different countries, we are organising now the official Lions Golf World Cup & European Championship 2016 taking place on November 4-5 in sunny Southern Spain. This Golf Tournament will be the biggest Lions Golf Event in Southern Spain with outstanding prizes. 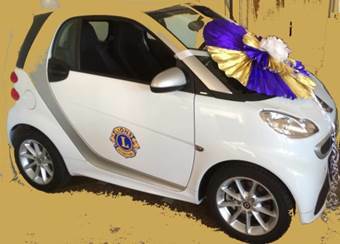 The tournament winner can win a Mercedes Smart donated by Fischer Car Gallery, expensive watches, or hotel vouchers. Lions Clubs International President, Bob Corlew, will attend the Opening Ceremony (November 1). For only €390, you can join this very special golf event (two days golf tournament with buggy, gala evening and much more). If you wish to join, please contact Dr. Volker Bernhardt on (+34) 630794369 or at charity@drgolf.info.